Design Thinking is about using the creative approaches and methods that designers traditionally use to solve design problems, as a mindset and philosophy that can be applied to any field – business, education or government, to name a few. 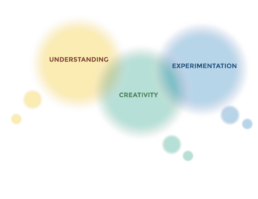 This includes emphasizing understanding, creativity and experimentation in the approach. 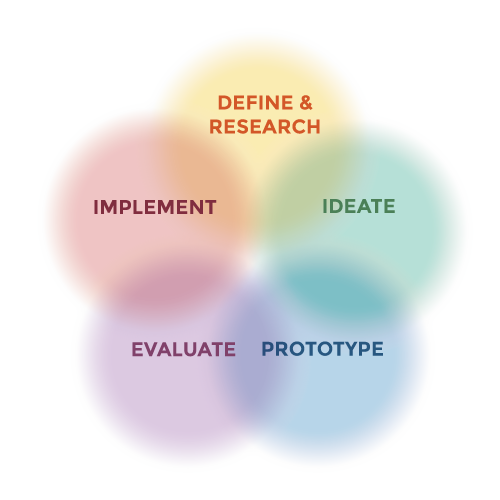 For example, in the same way an interaction designer values research and creative explorations as vital parts of the process of designing a highly engaging app, an entrepreneur can do so when crafting a business model; an educator can do so for designing a curriculum for third graders and a government officer for designing a public service reform. The variables change according to the topic area, but the methodology behind it is the same. The Design Process is Design Thinking in action – the actual steps and phases taken to generate way(s) to answer a problem. It goes more or less like this: defining the challenge, researching around it, brainstorming different ways to address it, experimenting and testing a few different directions, collecting feedback and incorporating it into iterating and refining the output. It is a non-linear, agile and open ended process, in which you keep diverging and converging, revisiting previous decisions and steps and constantly measuring and improving. For example, that interaction designer would map out personas, the landscape, the business goals and scenarios; come up with possible user journeys and flows, test them through prototypes, collect feedback and iterate the design accordingly before launching the initial version of the app. Again – the same can be done for crafting a business model, an educational program or a public service reform. 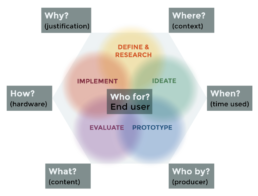 User/Human Centered Design is a design process that revolves around the end user and is driven and guided by their needs, wants and constraints. Many times outputs are designed not with a user’s needs or abilities in mind, but with someone’s need to sell something to that user. Consider the difference between technologies that require users to conform to them and the constraints they pose, or manipulate the user, versus those that are designed to be intuitive for the user. Attributes like usability and accessibility are key, and empathy must be employed heavily throughout the process – so field work with the user and in their environment through the research, prototyping and iteration is indispensable and works best when its’ highly participatory. Suspending judgement and being mindful of assumptions is very important, and you have to be partly psychologist and sociologist. This is about really understanding the user’s lens and needs and designing the full product experience accordingly to maximize its’ use potential and empower the user by it – whether the product is an app, a business, curriculum or government service. 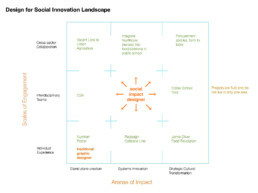 Social Impact Design is the human centered design process applied to a social issue. It starts at a social problem – poverty, hunger, healthcare, etc. It never starts with a solution. The problem is researched and mapped as a human and social system. The stakeholders are identified as are their interactions, and their personas and journeys are mapped. We synthesize and develop insights, looking for leverage points. We repeat the design process as we zoom in to a specific part of the problem, researching, journey mapping and ideating possible interventions. We involve the stakeholders and the end users – communities, population groups. The research will define the form the intervention will take, what will be most feasible and have the most significant impact – will it be a service? A physical object? We work collaboratively, in multidisciplinary teams so we can cover the problem from as many angles as possible. We define metrics for success and we continue the process, which doesn’t ever really come to an end, hopefully – constantly building on and improving on our impact. So like the app, the business, the curriculum or government service, we can come up with more accurate needs and asset driven interventions around big social problems, that can be widely adopted and truly address gaps and unmet needs for the people at the heart of it – like civilians in conflict areas or young women. We test, collect feedback and iterate. We need to be able to employ the design process at all levels – from the systemic problem to the specific point of intervention and across disciplines.